A skeletal horse stumbled down a country road in the dead of night. She had fallen several times already, once into a nest of fire ants. Those bites burned all over her emaciated frame. When she fell again, it was into the arms of good Samaritans. They had come across this nightmarish vision and called the local sheriff who, in turn, got in touch with the Humane Society of North Texas. 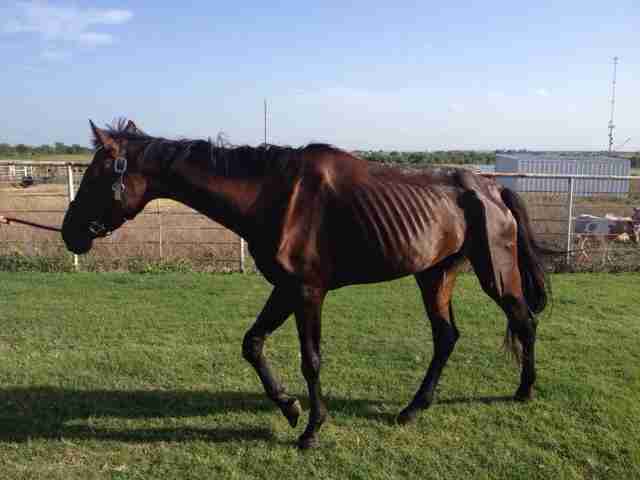 This withered, seemingly hopeless mare was named Stella. No one knows where she came from, but Stella hadn't known love in a long time. In a way, she was lucky. There are some places in Texas where horses never know love at all. "When we got there to help, she was actually down," Whitney Hanson of the Humane Society of North Texas tells The Dodo. 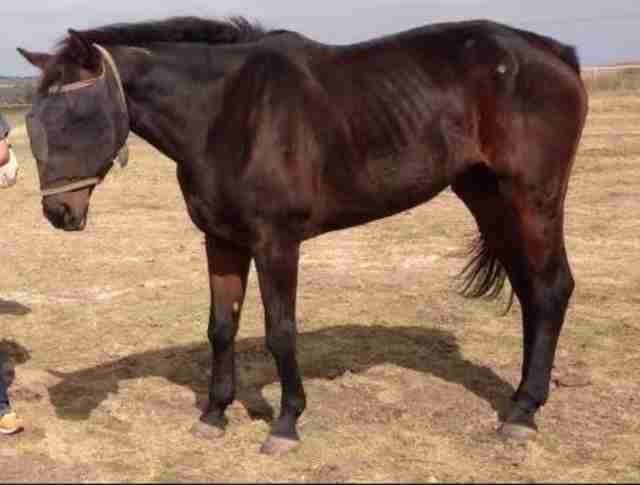 "For those people who know about horses, the worst thing that could happen is for a horse to stay down." 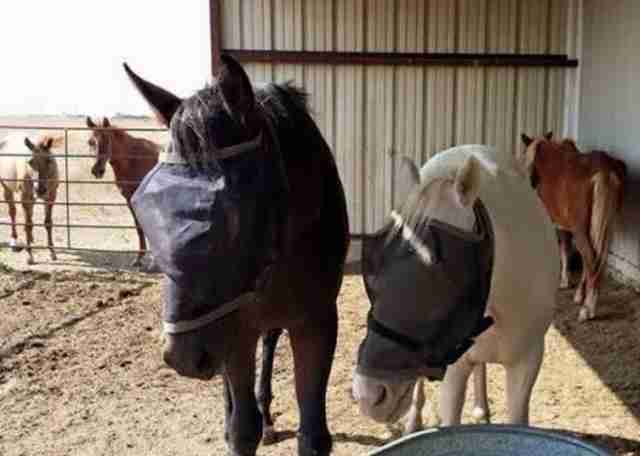 Rescuers managed to get Stella to the organization's property, where horses are rehabilitated. But she still couldn't stand on her own. They devised a unique solution, an enormous sling held aloft by a heavy-duty pallet lifter. So for weeks Stella was buoyed only by machinery and tethers. "We were treating those bites and working with her trying to build up her strength and getting her to gain weight," Whitney recalls. Her spirit would have to do the rest. Stella started putting on weight, eventually gaining several hundred pounds, every ounce critical. And then, she found her feet. "She started going on short walks," Hanson says. "Then she started going on longer walks. Then she started running." Today, it's hard to imagine the apocalyptic vision Stella must have once appeared on that lonely country road. 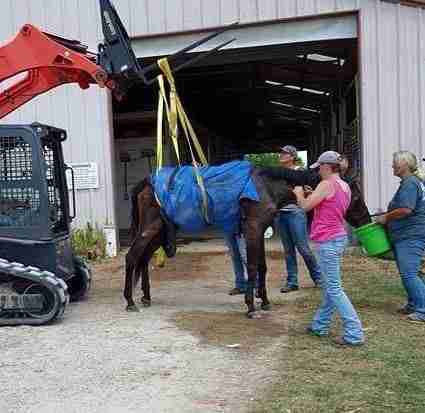 This mare's road leads only to hope and a new life. "It's just been a really, really heartwarming transformation to see," Hanson says. The final step on Stella's journey? She's looking for a home. But she doesn't want to walk this road alone any more. Stella made friends with another horse at the rehabilitation center, a dazzling white mare. "We're hoping to get them adopted together because they're best friends," Hanson says. "They're inseparable." Think you might be able to help them? Visit the Humane Society of North Texas or email livestock@hsnt.org.